Future scientists like Callum Peaker and Winstern Beni from schools across the Fraser Coast have showcased their skills at the 2016 Science Research Awards, hosted by the University of the Sunshine Coast. 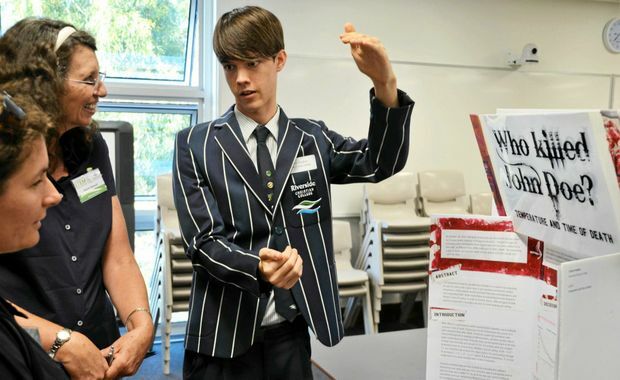 Almost 40 senior students presented research projects to a judging panel made up of industry scientists and academics a the special awards, held at USC’s Fraser Coast campus on Thursday. The awards were an initiative of the Queensland STEM Education Network, of which USC is a partner. The network aims to encourage interest in science, technology, engineering and maths among secondary students. “The network aims to encourage interest in STEM – science, technology, engineering and maths – among secondary students, and raise wider community awareness of the importance of STEM education and STEM-related careers,” Ms Lanham said. USC STEM Project Officer Sue Lanham said the competition challenged students to formulate a hypothesis to a scientific question, undertake a scientific investigation, and present their answers. Students also competed in a fast-paced, entertaining ‘Three Minutes to Win It’ competition where they must succinctly explain their projects to the judges and audience.“With only three minutes on the clock and one PowerPoint slide allowed, this competition was very entertaining,” Ms Lanham said. Year 12 Urangan State High student Winstern Beni wast the Fraser Coast regions overall winner.